The Caney River Ranch is a diverse and productive agricultural property that is also beautiful because of its unique topographical features. With steep rock-lined canyon walls along the creeks and the two miles of the rock-bottomed Caney River, it’s hard to believe that you are in Kansas. With generous food and water sources, and the remoteness inherent to this area, the wildlife populations on this ranch are second to none. The ranch is within the Flint Hills that are covered with the prolific tall grasses where cattle grazing is so well known. The soils that make up the river bottom cropland historically produce bumper crops. It currently is enrolled in the Walk-In Hunting Access program implemented by the Kansas Department of Wildlife. This program can be canceled if so desired, but it does provide a very generous income stream to go along with the grazing and farming rental income. This ranch has stunning physical features along with a very appealing agricultural income stream. John joined Hall and Hall to set up and run our Kansas office in 2010. He has marketed farms, ranches, equestrian centers, cattle feed yards, and agricultural water rights throughout Kansas, Oklahoma, Texas, New Mexico, Colorado, and Arizona. Born and raised in Kansas, John grew up around ranching and ranch real estate. John attended Kansas State University, became a licensed pilot and joined his father at Doug Wildin & Associates Ranch Brokers in 1978. Since then he has successfully marketed hundreds of thousands of acres of farm and ranch real estate. 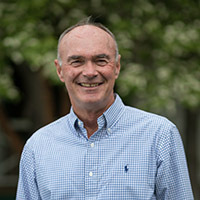 He has spent his career developing personal and business relationships with many agricultural producers throughout the United States and serving their real estate needs in an ethical and service oriented manner. His decades of farming and ranching experience served as a background for his broad working knowledge of all phases of livestock and farm production agriculture. John loves the outdoors and relishes time spent at his second home in the Colorado mountains. John resides in Hutchinson, Kansas and has two grown children. Caney River Ranch is a scenic Flint Hills cattle ranch with outstanding hunting and fishing. This ranch is located in southeast Kansas about midway between Wichita and Tulsa. Two miles of the rock-bottom Caney River plus four live creeks provide a unique topographic diversity on these 4,700± acres of rolling flint hills. There are approximately 250 acres of river-bottom cropland, with balance in native tallgrass prairie. The physical diversity of this ranch, with the two northern canyons joining and running through the middle of this ranch, provide for an abundance of trophy whitetail deer and wild turkey. The Caney River is also a renowned source of record-size catfish and flathead fishing. The Caney River Ranch is a good combination of excellent grazing land, productive river bottom cropland and tree-covered draws and canyons that contain the live creeks and the Caney River. The generous water sources make this a good year-round cattle ranch with plenty of cover for the winters. There is a good house/hunting cabin located down on the south end of the property. Managing for commercial hunting on this property is very doable. The distinct diversity of the ranch allows for good income streams from cattle grazing, farming and commercial hunting. Located approximately 85 miles southeast of Wichita, Kansas, and nearly 100 miles northwest of Tulsa, Oklahoma, in the southern end of Chautauqua County, the Caney River Ranch is fairly remote and therefore less likely to be exposed to unwanted encroachment by strangers. There is a state highway just six miles north of the ranch for easy access in and out of the immediate area. Within a 40-mile radius, there are three jet-capable airports and there is daily commercial service out of both Wichita and Tulsa. The Caney River Ranch is situated in the southern portion of one the world’s most productive natural ecosystems known as the Flint Hills. This tallgrass prairie is naturally prolific due to the inherent soil types, the generous annual precipitation of around 36 inches and a growing season of nearly 190 days. These rolling hills and canyons are marked with large rock outcroppings and boulders in and along the Caney River and the four live creeks. With productive river-bottom land and the natural topography, it is easy to see why this area is known for trophy whitetail deer. The average high temperature in January is 31 degrees and the average high temperature in July is 81 degrees. Average annual precipitation is 39 inches. Local elevation is 1,000 feet above sea level. The ranch averages around 190 frost-free days yearly. Elevation on the ranch ranges from 785 feet to 982 feet. There is one house on the south end of the ranch that was completely remodeled in 2007. It has four bedrooms, one bunkroom with three bunkbeds, one full bathroom, three 3/4 bathrooms and one half bathroom.Outbuildings include a 60 X 80 pole barn, an 8 X 20 storage container, approximately 12,000 bu. of grain storage, and 10 X 10 shed with concrete floor. The mineral rights are intact but are not included in the sale. Property taxes for 2015 were $13,608.40. This 1,920± acre Flint Hills ranch is located 65 miles east of Wichita. Open rolling grazing country divided into two pastures with excellent fencing and access. Immediate possession. $1,950 per acre. Sitting halfway between Tulsa and Wichita, the scenic 7,671± acre Cedar Vale Ranch is comprised of a limestone based tallgrass prairie with two miles of the Caney River and several live creeks. One of the finest ranches in Kansas famous Flint Hills, this 8,675± acre property includes live creeks, springs, 60 ponds and lakes, trophy deer hunting and valuable mineral rights. It features excellent working improvements, good fences and a beautiful owners residence. 6,459+/- Acres in the Kansas Flint Hills Located 30 miles northeast of Wichita, this Flint Hills ranch is in excellent condition. All contiguous, four large watershed lakes, good fences, gently rolling open hills. Offered as a whole or in smaller tracts.